For the second straight day in August, the sun seemed to disappear in the middle of the day. But this time, the moon’s orbit couldn’t be blamed on the partial darkness. We were driving to Cleveland for a baseball game between the Red Sox and Indians, and we were in the middle of a very heavy rain storm. It was if someone had taken the city of Erie and hidden it as we drove past it on Interstate 90. It caused me to remember the fact that something odd usually happens whenever I head to Cleveland for a baseball game. Why stop now? The strongest memory came in 1974, during summer vacation from college, and rain played the starring role. Three friends and I decided to go to Municipal Stadium for a double-header, featuring brothers Jim and Gaylord Perry. It was to be the first time they pitched together in a twin-bill. We left around 8:30 in the morning on a Sunday, and drove through some showers on the way. So we chanted “Prevail, Westerlies, prevail,” in an attempt to chase the clouds away. Just when we literally had gotten in sight of the stadium lights on I-90, a Cleveland radio announcer said that the double-header had been rained out. We drove on to the empty parking lot, where one of us stomped on relatively solid ground and yelled, “They could have played!” in spite of a forecast that predicted more rain for the afternoon. It was so disappointing that we drove around Ohio, Pennsylvania and New York in a daze, acting silly, posing for funny pictures, and laughing a lot. The only drama came when we had a car thermostat die in the Pymatuning Valley of Pennsylvania, a place so isolated in the pre-Interstate 79 days that we’d have trouble describing to someone’s parents how to come get us. Somehow, we stumbled on a mechanic who was working on a Sunday afternoon to fix it for $4. We tipped him a dollar, and went on our way. I remember when I finally got home, my mother asked where we had been for 15 hours when the games had been rained out. I’m not sure, I responded, but it was a great time. My trips to see the Indians weren’t always soggy. One time, Oscar Gamble of the Indians hit a ball about nine miles long and a foot foul off Boston’s Marty Pattin. I read later that when catcher Carlton Fisk went out to remind Pattin that throwing that pitch again wasn’t a good idea, Pattin screamed at him to shut up, and go back and catch. Gamble eventually rounded third so many times that day that the third-base coach probably needed rotator cuff surgery from waving him home constantly. When Pattin made his inevitable premature exit from the game, he reportedly destroyed every light in the tunnel on his way back to the clubhouse. A few years later, a bunch of us head to Municipal Stadium to see a twi-nighter with the Angels. We made fast friends with a father and his three boys, who were there with a church group and sitting in the next row. The family was right off the farm, and incredibly innocent; you could have cast them for a remake of the Ma and Pa Kettle movies of long ago. I wanted to call the oldest of the boys, who was 16 and about 6-foot-6, “Stretch.” They all delighted in making gentle fun of the Methodist group that was called on the p.a. system to report to the bus before the end of the second game. (“It’s past their bedtime!”) But the big highlight of the evening was the Great Wallenda, as Karl walked on a tightrope from foul pole to foul pole between games. How did he do that stuff? We still wonder about that, three generations later, now that Nik has taken over the family business. This time around, our trip seemed more conventional for a while. We arrived a little before 6, the sun was out … and the tarp was still on the field. Hmm. Radar revealed that a heavy storm was coming, so the game was delayed to see what might happen. 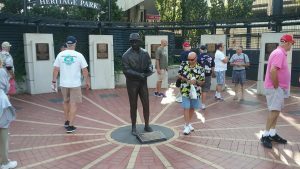 We took a loop around Progressive Field, a place I hadn’t visited since Alex Rodriguez came to town with the Rangers, and noticed all the changes. A really nice “Heritage Park” with statues and plaques about franchise greats is in right field now, while the parts of the stadium have been closed off as the Indians reduced the seating capacity to make tickets a little less available. The Red Sox fans in the audience, and there were a lot of them, looked concerned when Doug Fister gave up a home run on the third pitch of the game. Fister came in with a 2-6 record and a high earned-run average. In other words, you’d think the Indians might sell medical insurance to those in the bleachers in case they got hit by flying baseballs. But Fister settled right down and eventually Boston pulled ahead by a good margin. As the game went on, we got to know our seat neighbors a bit. One family sitting right behind us was from Lancaster, and was a neighbor of my wife’s former boss. Small world. Fister went on to pitch a complete-game, one-hitter –you could have gotten long, long odds on that happening at 6 p.m. And just to add a finishing touch, as I rounded a corner after the game, two good friends from my high school class in Clarence were standing there. Ridiculously small world. It’s always a good idea to go to Cleveland for a baseball game. The park is very nice, the baseball is usually good and the people are friendly. Just make sure you bring an umbrella, and expect the unexpected. Trivia answer: Michigan (Tom Brady and Gerald Ford); Stanford (John Elway/Jim Plunkett and Herbert Hoover); Miami of Ohio (Ben Roethlisberger and Benjamin Harrison); and the Naval Academy (Roger Staubach and Jimmy Carter). Click here for more from Budd Bailey.